Spirits. The name itself conjures up evocative images. There's the dictionary definition: DISTILLATE 1: as (1) : the liquid containing ethyl alcohol and water that is distilled from an alcoholic liquid or mash -- often used in plural (2) : any of various volatile liquids obtained by distillation or cracking (as of petroleum, shale, or wood) -- often used in plural b : a usually volatile organic solvent (as an alcohol, ester, or hydrocarbon). Then there are the more apt connotations. The notion that alcohol somehow usurps or destroys the spiritual side of man even his will power and self control. At its worst it could mean some sort of possession involving entities or disembodied spirits, which would explain where the name comes from and why addiction is so hard to stop. Another book I read several years ago, Witness to the Fire: Creativity and the Veil of Addiction, by Linda Schierse Leonard, made me aware of another attribute of alcohol and addiction in general; that creative people often times are affected and that there are Jungian archetypes involved. The one I found most intriguing was "The Trickster." The example she used was Jack London. He was not a raving alcoholic but he was in denial, so much so that he wrote a book called John Barleycorn. In it you'll find some of his finest writing. He extolls the false positives of alcohol and writes of the dangers. Indeed, the book became a clarion call for temperance. It helped usher in Prohibition. All the while the trickster in London was at work. He continued to drink but rarely to excess. Most of his friends never considered him an alcoholic. The trickster did his job well. In The Alcohol & Addiction Cure, the trickster has a death grip on the author's son, Pax. In the heart-rending and gripping chapter called, "To Hell and Back," you'll read of Pax's heroin addiction, a battle that he could not have won without the aid of his father. Pax was indeed fortunate to have someone so perceptive who knew instinctively what it takes to defeat the trickster. Chris Prentiss' deep love for his son, his devotion to truth and to matters of the Spirit rendered the trickster powerless. The author sought every program and cure possible for his son. Always he sensed there was something lacking. None addressed the spiritual side of man. None went to the core of the problem. Few were able to strip the soul and able to properly build her back up. Together father and son did this. 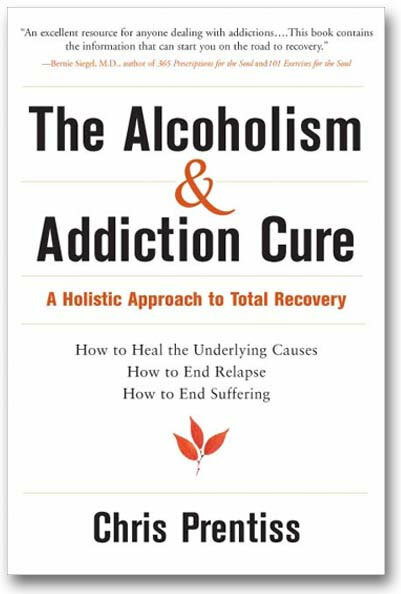 In so doing, the son found his life's purpose: to bring their search and the wholistic approach to curing addiction to the general public. And so a recovery facility called Passages was created in Malibu, bringing together all that they had learned. The years of fine tuning the program with cutting edge holistic healing therapies has resulted in this excellent book. I heartily recommend it to all, especially to those who have friends who have addictions. You'll have to read the book first. The trickster in them will not countenance any interference by such a dangerous book. In a Near Death Experience, George Ritchie in his book, Return from Tomorrow, gives a fascinating account of what a bar looks like from astral levels. As he flew by out of his body, he witnessed disembodied spirits desperately trying to take a sip from patrons' drinks. The only way to satisfy their vicarious cravings was to jump inside the body of a completely intoxicated person. I've excerpted the entire episode. You can find it in the article I've written on Possession. You will also find some spiritual keys and tools there to help in ridding oneself of these entities who like to drink and do drugs. Quitting addiction is possible without these tools but it takes a program with the ability to go to the very nadir of the problem. With an 84% success rate, Passages obviously goes to the very core of addiction, finds the cause and then replaces the void with purpose and spiritual fortitude. The author is a rare breed. After reading the book, you might find yourself hoping that someday you might meet both him and his son, to witness and commune with such a victory of the human spirit.